According to a report culled from E24-7Mag, Kenny, who already has five children, is expecting 3 new babies one from his Baby Mama-Fadekemi, another one from one lady named Modinat, and Funke is reportedly pregnant and said to be due in mid-July of 2013. The case of Modinat seems to be most pathetic as she is caught in the middle of the storm and was coerced to keep her mouth shut in exchange for Kenny’s continued generosity. “A Lagos trader, Modinat Nike Dada, in her late 30s is seven months pregnant for Funke Akindele’s husband, Kehinde Oloyede, E24-7 MAGAZINE can authoritatively reveal. Modinat, mother of two boys and popularly known as Mama Dayo, was formerly married to a man simply known as Dayo. Both have since separated. The marriage crashed some years back due to irreconcilable differences and alleged domestic abuse. Her former hubby was a wife beater, alleged some sources. But when the situation became life threatening she had to leave the man and joined her elder sister, a successful clothing merchant in her shop at Oshodi. 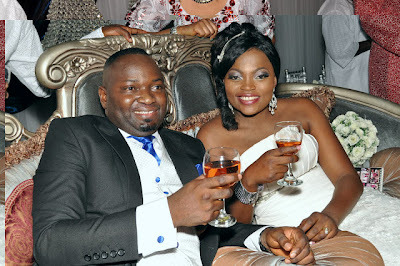 Her former hubby, Dayo, was a graduate of Ogun State Polytechnic, Abeokuta. Not a few family members were surprised to know that the marriage did not last because they were like two inseparable lovebirds when they were dating. The former hubby took the two children away from her and kept them in her mother’s custody in Ijebu Ode, Ogun State. Though life threw a big storm at her, she found solace in the love and care from her immediate siblings who were not only always around her but promptly responds to her needs. Modinat in her late 30s quickly picked her life up and became industrious. She traded in some fast consuming goods which she was selling in wholesale to retailers. When she finally moved to her sister’s shop, her path crossed with Kehinde Oloyede, popularly known as Kendoo. Incidentally, Kendoo a property merchant is the landlord of her sister’s shop in Oshodi. He found in her a good and amiable friend and as fate would have it, she found herself in his arms. Modinat and Kendoo instantly became an item and they were seen together at some of their close friends’ private parties. The romance thickened, they shared great moments together and there was pressure to get pregnant. Not once or twice inside sources said the Ota, Ogun State-born trader was accompanied to several spiritualists and gynecologists by Kendoo in their bid to seal their romance with a baby. Sometimes in March, she got pregnant and filled with joy, she announced to her lover-boy, who close sources said was not ecstatic about it. “He practically took off, he stopped coming to her house, shunned all entreaties and stopped picking her calls,” E24-7 MAGAZINE’s source hinted. The following month, Modinat was shocked to read in magazines and newspapers that Kendoo wanted to marry the Return of Jenifa’s star actress, Funke Akindele. She was devastated, flustered but once again, her family rose and stood firmly behind her. In the last few months, Modinat has been under intense pressure to keep her mouth sealed and advised to avoid the media. Sources close to her confirmed that she has been inundated with calls by several people close to the famous actress, Funke Akindele, to keep a low profile and keep the ‘family’s’ dirty linen away from the public. She has been promised juicy offers if she delivers without spilling the bean and grudgingly she has accepted. Modinat, who currently lives in a tastefully furnished apartment in Agege area of Lagos has accepted her fate and rejoices in the fact that the baby she is expecting would bring joy back to her again. Since her former hubby took her two boys away she has not set her eyes on them, she feared the estranged hubby might move them abroad and cut her links to them forever. Her consolation is in the baby she’s expecting to be her companion in years to come. As it were, Funke Akindele’s hubby with five kids already is expecting in the next few months three additional children in his harem. His second wife, Fadekemi is in the last trimester of her pregnancy and is due to deliver soon.